Service and support wherever you exhibit! 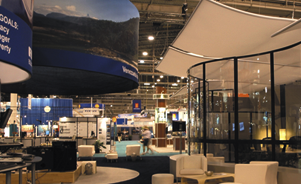 Skyline is a global leader in the exhibit industry with nearly 80 dealers in North America and representation in 30 countries and has served well over 150,000 clients. 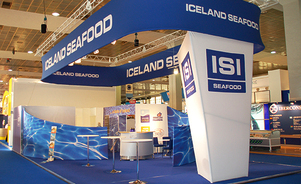 Exhibiting internationally can be rewarding – and challenging. Rely on Skyline. 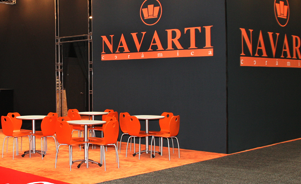 We have trade show professionals in 30 countries that can help you with anything from local customs and logistics to graphics and a full range of show services. 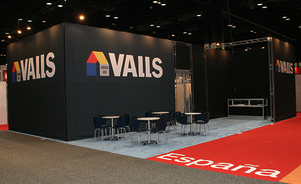 Why waste time and money to ship exhibit assets internationally when you can rent an exhibit in the city/country of your show? Rent a custom design from Skyline and reduce costs, potential shipping delays and any hassles with Customs. "The structure, the color and the decorations were designed to look like Chinese culture. It has an authentic feel," says Shan Zhong Zhu, director of the CNTO office in New York. Six colorful photos of a giant panda, the Great Wall and other sights in China – printed on fabric banners more than 8’ tall – hang between the pavilion’s columns. The sheer banners picture a tempting destination while creating privacy with an air of openness for two conference areas within the pavilion. Zhu says the architecture and graphics make the exhibit stand out: "When people go to the show, they see the China exhibit clearly. It’s not like any of the other booths." 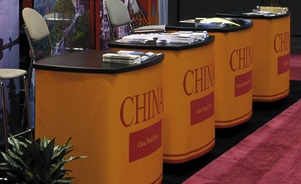 CNTO’s North American offices in New York, Los Angeles and Toronto sometimes share the exhibit in their efforts to promote tourism, one of the fastest-growing segments of China’s economy. 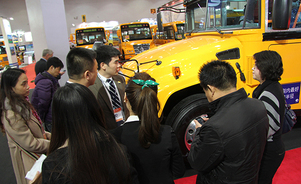 The Motivation Show in Chicago positioned a trip to China as a sales incentive, with Beijing and Shanghai as popular sites for meetings and conventions. A lively 60’-by-70’ exhibit clearly positioned Petróleos de Venezuela S.A. (PDVSA), the national oil company of Venezuela, as a global energy giant at the Offshore Technology Congress in Houston. Since PDVSA promotes the country as much as the company, Skyline designed the exhibit for tourist appeal with maximum impact in every detail. Three jumbo double-sided hanging signs – rings with a 16’ or 22’ diameter – featured 8’ tall fabric graphics representing Venezuela’s commitment to industry, social programs and the environment. An assortment of videos showed on 13 plasma screens. A cyber café offered four workstations with Internet access. A company-sponsored car that raced at LeMans commanded prominent display. And, for authentic culture, Skyline arranged live music by a popular Venezuelan band and recruited a team of five bilingual hostesses from Venezuela. PDVSA planned to conduct business at the conference and needed meeting space, so the design included three large conference rooms plus a press office and a technical office. Clear 9’ glass panels showcased business activity in some areas, while frosted glass ensured privacy in others. An estimated 500 people jammed the exhibit for a closed-circuit view on the plasma screens and computer monitors. Thirty minutes later, the conference rooms reappeared, and 40 extra chairs hid in the exhibit’s storage space.